Rules of the Prahran Football Club Inc. Select “NO” if your child has only played Auskick previously. Select “YES” if your child has played club football (U8 or above) for another club. To be eligible for the 2019 season, players must be at least 7 years of age as at 30th April 2019. No previous playing experience is necessary, however a minimum one year of AUSKICK is recommended. PJFC are proud to support a community program that covers the registration fees and uniforms for families that need financial support. Please contact Elle Payne at registrar@prahranjfc.com for assistance if required. Games are played every Sunday, starting with the Under 8s at around 8 am. 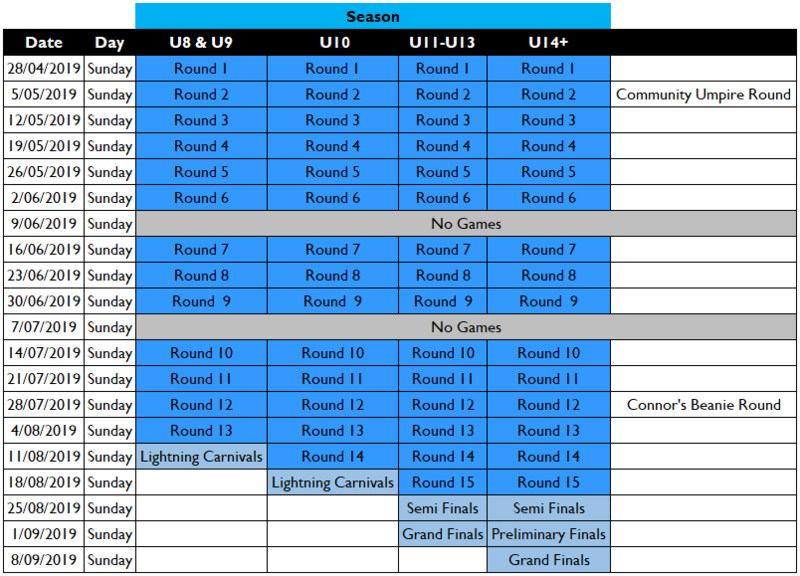 The first games will be played on Sunday 28th April 2019 (Round 1). Training – Training is held each week, with optional skills training on one afternoon per week (likely to be Wednesday in 2019). Under 11 and 12 will have additional team training on Wednesdays. The main team training is held on Friday afternoons at Toorak Park from 4pm. Under 8’s, 9’s and 10’s start at 4pm with older teams starting later. The training schedule will be advised on 2nd April 2019. Pre-Season training is expected to commence in February 2019. Uniform – Players are required to wear a PJFC playing jumper, shorts and socks for all games. The club provides a playing jumper (on loan for the season) as part of your registration fee. Socks ($15) and shorts ($30) can be purchased from the Club at an additional cost. The online uniform shop is expected to be open in January 2019. Mouth guards and boots – These items are purchased separately by parents. Mouth guards are COMPULSORY for both training and games – the policy is strictly ‘no mouthguard, no train or play’. The PJFC Open Day is being held on 25th of March 2019 and mouthguards and football boots can be purchased from our sponsors on that day. Parent involvement – Parent assistance at matches and training is incredibly important. Match day duties include: first aid, runners, umpire escorts, timekeepers, scorers, goal umpires and general assistance. We strongly encourage a rotation of game day duties amongst all parents to promote participation. If an application to register a player is not accepted for whatever reason, a full refund will be processed.